Jaimie Hebert, who chairs the Department of Mathematics and Statistics, has been named interim dean of the College of Arts and Sciences at Sam Houston State University. David Payne, vice president and provost, said that Hebert will serve in the position vacated by Brian Chapman, who recently accepted the job of provost at West Texas A&M. "I am honored that the provost has asked me to serve the college and university in this capacity," said Hebert. "The College of Arts and Sciences is a very diverse college with a variety of departments and programs. "As the chair of the Department of Mathematics and Statistics, I have witnessed the successful evolution of our college programs over the past six years. I am excited about the opportunity to work with each of these departments and programs as they continue to grow and prosper." Payne praised Hebert's work and said he believes he is an excellent choice for the position. "I am delighted with the appointment of Jaimie Hebert to this position," said Payne. "He has been highly successful and a distinguished leader in the Department of Mathematics and Statistics and we look forward to his providing strong leadership during this interim period." Hebert received his Ph. D. in statistics from the University of Louisiana at Lafayette in 1990. From 1990 to 1995, he was an assistant professor of mathematical sciences at Appalachian State University. 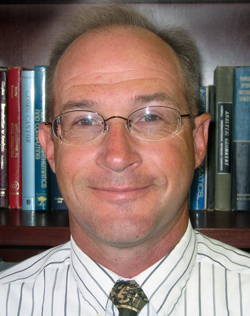 He joined the faculty at Sam Houston State University in 1995, was promoted to associate professor in 1998 and full professor in 2004. In 1999 he was appointed chairman of the Department of Mathematics, Computer Science and Statistics (now the Department of Mathematics and Statistics). Hebert has been an active researcher throughout his academic career, publishing 29 manuscripts in professional journals and serving as principle investigator or co-principle investigator on numerous research grants. He served the Journal of Developmental Education as research editor from 1991-1995 and senior research editor from 1996 to the present. He has served on the executive committees for the Mathematical Association of America-Texas Section and the Conference of Texas Statisticians. He is currently secretary of the mathematics association's Texas Section. He is a member of the American Statistical Association, the Mathematical Associations of America, the Institute of Mathematical Statistics, and the Texas Association of Academic Administrators in Mathematics. Payne said that an interim chair of the Department of Mathematics and Statistics will be named soon.